Some cheesy monster movies are a delight to watch — and others are a delight to make fun of as you watch them. The Tomb falls firmly into the second category. The basic plot has two Indiana Jones-wannabees (more honestly described as grave robbers) breaking into an Egyptian burial ground, where it appears that an illegitimate Egyptian princess turned high priestess, turned pure evil (murdering children to maintain her youth, drinking blood, eating hearts) was entombed alive. One of the two (played by David O’Hara, listed here as David Pearson) makes it out alive, returns to the United States, and sells the purloined objects to multiple buyers. 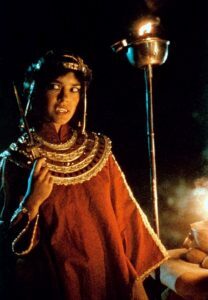 The still-living Egyptian priestess Nefratis (played by Michelle Bauer ), with vampire fangs and all, is in hot pursuit to reclaim her objects, leaving a trail of corpses in her wake. The son of one of her victims decides to stop her. There’s so much bad here, it’s hard to tell where to start. The script was written in 10 days — my daughter Trudy asked, what did they do with the other 9? It was filmed in 13 days — Trudy correctly stated that the original Little Shop of Horrors was written and filmed in seven days — and was a much better movie. The acting was somewhere between wooden and terrible (with the exception of John Carradine, who did a fine job as a professor of Egyptology — but was onscreen for less than five minutes. Glowing hand special effects? Check. The special effects were down-right terrible. The “ancient” props looked like they were made as cheaply as possible, and they probably were. There is, frankly, nothing nice to say about the film. The archaeologist with no medical training opens a man’s chest to remove the mystical scarab that’s torturing him. Because having ‘Doctor’ in front of your name makes you qualified to perform heart surgery, right? The villain’s entire demise, including being set on fire for no reason other than to make a better climax. Firing a single bullet at a small airplane causes it to burst into a massive fireball.